“A bit deaf in one ear and a bit daft in the other.” Humour, social media, cats, chocolate and Nottingham. Love, equality and tolerance; reject hate. When I moved to Nottingham in the 1970s I made these annotations on a selection of typical phrases used by local colleagues and neighbours. Some of these idioms have almost vanished from daily use in the last few decades, although you still hear similar phrases in some Nottingham neighbourhoods and in older generations of local people. A few younger Nottingham residents now have an inflection of ‘Estuary English‘; a euphemism for a mild version of the London and South East accent, which has flourished for hundreds of miles outside of London. Ow ya gowin on then, Serri? How are you? Just remember IT’S A COB! Ahrode ay-yo? How old are you? Aya gorra mardilippon? Are you sulking? Aya gorra wi’ya? Have you got her (wife) with you? Aya gorrim wi’ya? Have you got him (husband) with you? Aya gorrowt? Have you any money? Aya masht miduk? Have you made the tea yet? Ezz ee sed owt? Did he say anything? Gizzabitt Can I have some of your … ? Jagadahn? Did you go to the Nottingham Forest / Notts County match? Jo wonn-owt? Would you like anything? Kannicum annorl? May I come too? Oo worree wi? Who was he with? Wair dya wekk? Where do you work? Wairza booza? Where is the local pub? Wi or wi’yaut? With or without? Worree wee iz-sen? Was he alone? Wotsupp? Is something wrong? / Is everything alright? Wotyavin? What would you like to drink? Wot yonn-wee? What are you doing? Yerwott? I beg your pardon? Gerroffahtonnit! Go away / leave it alone! Shut ya gob! / Purra sock init Shut your mouth / Shut up! One of my dear friends, Audrey Scattergood, was queen of the Nottingham Quincentenary celebration in Nottingham in 1949. Does any one have any details of that event? I’d love to learn more. When I started work for the Publicity and Information Office in the 1970s there was a member of staff who had been in the office at the time of the Quincentenary celebrations, but she died many years ago. I also looked after the office photograph library for quite a few years and there were black and white photos and a programme from the event, but we passed all of those on to the Local Studies Library at Nottingham Central Library many years ago, so I expect they must have some information about the celebrations. 28 June 1949 ~ When the Quincentenary visit of Princess Elizabeth and the Duke of Edinburgh took place. Thank you for your reply. I’ll try to contact the Local Studies Library to see if they might have anything in their records. I’ve enjoyed looking through your website. These phrases sound double Dutch to me, gibberish! One of my favourite books about the English language is “Mother Tongue” by Bill Bryson. He ponders about dialects in GB and says it’s no exxageration to assume that in Britain there are as many of them as hills and valleys, if a dialect is defined as a way of speaking that fixes a person geographically. THis makes me smile a confused smile. We are currently preparing a bid with Nottingham Trent University about dialeacts around the East Midland. It would really be great if you could get involved in some way if we are successful. 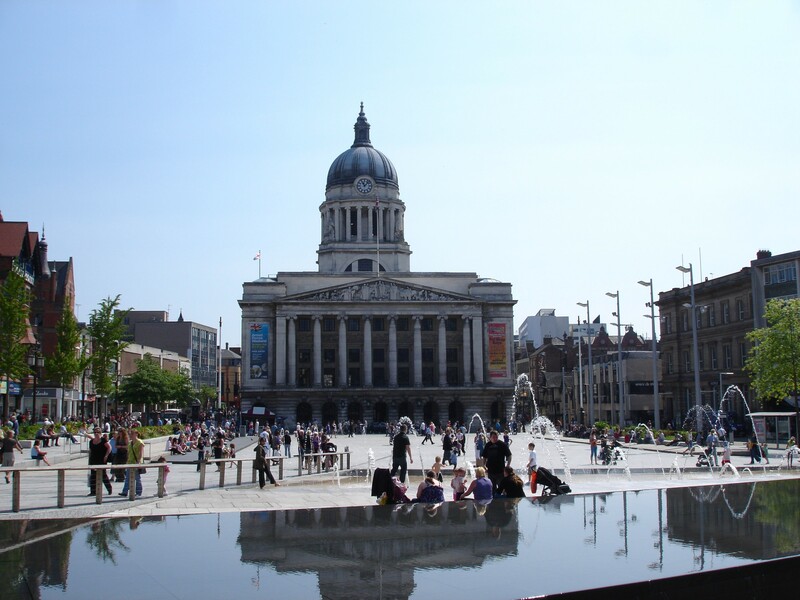 As we have a love affair with Nottingham, we were delighted by this blog. Helen (Embrace Heritage) may be in touch. Thanks Annette, I found a copy of vol 1 on Amazon; I shall look out for that locally now. I moved to Canada and am from Mansfield. I was just explaining the other day some of this to mi mates!!! I was also going to say that you’re just talking to the wrong people if you don’t hear these no more ! Endorse all of it plus a bit more as I am from Worksop ….note not Warsop but Wossop ! Grew up thinking this was standard English ,went to Retford Grammar School and the difference in 8miles was very plain. I tell French friends that every village in England speaks a unique dialect. The expressions used were just like are shown on the Nottinghamshire dialect page. However each small village had a slightly different way of expressing itself & you could tell which local village a person was from if you were really tuned in to the way the person spoke. Rainworth or Renerth!! My Dad lived around that area – I wonder if you knew of him – Ronald Gregory? i grew up in a north notts village called calverton a friend of mine grew up in eastwood we both now live in cardiff and our welsh friends cannot get over how different we sound, but we have great fun confusing them with some of the lingo. I grew up in Arnold, and often went on a bike ride to Calverton Lido if summer fell during the school holidays. God that springwater was cold. One time we were on the grass next to two gorgeous twin girls wearing matching ladybird (red and black dots) bikinis. I was about 14 and they would be 17 or 18 and wouldn’t have been seen dead talking to me, but I’m still in love even today. You can still hear all those words round Sneinton and Ilkeston! I live in New Zealand now but my children all use words like nesh, mardy and manly though no-one else knows what they mean! I once saw “nesh” as a word on Call My Bluff and no-one got it right – I was sitting at home saying EVERYONE knows what nesh means!! I see even the computer doesn’t know these words and self-corrected “manky” to “manly”!! Great nostalgia site. Born in Nottingham but lived in New Zealand for fifty years. Visiting cousins I noted and chuckled over many of their/your phrases, ie ‘gerrof causey or I’ll bat your tabs’, used by my wonderful cousin to admonish a local who had wandered too close to our shiny new car. Thanks Stephen, some of my favourites are ‘Aya gorra mardilippon?’, ‘Wigorn tev uz dinnaz’ and ‘Worree wee iz-sen? I miss this language of short cuts and such !!! Growing up in Cheshire near yorkshire Darbyshire Lancashire,I heard these daily , My Dad who is in his 70’s spoke this lingo and so did some of our older relatives. He told me it developed during the years in the cotton mills as it was hard to hear. Any thoughts on this ?By the way I’ve been giggling and its been totally nostalgic ! Interesting idea Jacqueline, about the origin of some of the short cuts in speech that is. Wherever English is spoken it constantly evolves through use and the way people adapt it to their circumstances. Coincidentally I’m presently reading ‘Mother Tongue’ the story of the English language by Bill Bryson and he discusses how words can be shortened over time or by local dialect for example. Came across this site whilst searching for pictures of the Quincentenary celebrations. I took part in the ‘massed children’s choir’ which sang for Princess Elizabeth on the Forest. I’ll always remember her lovely hat – deep pink I think and trimmed with black velvet. Was anyone else in that choir?? Has anyone found pictures of the Quincentaenary? Loved being reminded of some of the lingo – couldn’t see yo = you. I was brought up in Daybrook and remember Dad asking his mates ‘juggerdahn?’ = did you go to the football match last Saturday? He was a Forest supporter. Hello Ann, I don’t have any photographs of the Quincentenary celebrations, but I have seen copies when I worked for Nottingham City Transport and for the City Council. I looked after some of their photograph libraries for many years and when I eventually had to dispose of old material I took it to the Local Studies section of Central Library. I do also know that the Nottinghamshire Archives on Castle Meadow Road have B/W photos of the celebration, ( http://discovery.nationalarchives.gov.uk/details/rd/8a5df35f-cf0b-4145-87a1-045f76408a4a ) but they’re not available online; I presume you’d have to visit to view them. Have you tried the ‘Picture the Past’ website? ( http://www.picturethepast.org.uk/index.php ) I did a quick search for ‘Quincentenary’ for Nottingham and the year 1949, and found about 22 images. Hi Roy. Many thanks for pointing me in that direction. Found just the image I was looking for. I always remember the copious usage of “like”. My girlfriend’s brother tacked it onto virtually every utterance.. I heard this saying about 50 years ago in Radford “On a barrer” meaning if you saw say a policeman on a barrow meaning not there. A selection of jokes and one-liners from the last ten years of the Edinburgh Fringe. The causes of behavioural handedness – Part 2: can it be learned? The causes of behavioural handedness – Part 1: is it inherited?